I once travelled to a place in the Eastern Cape called Elundini Backpackers (http://www.elundinibackpackers.com). It forms part of a category called ‘Responsible Tourism’ in that they’ve created a space for sustainable living near Hogsback and provide the most incredible experiences for tourists- live like a local, Xhosa bread making, hiking, mountain biking and a 3 day natural building workshop. I offered to make a vegan lasagna that night as I brought all of my ingredients however, what made it more challenging yet exciting was that it is an eco-lodge. No oven, microwave, minimal electricity etc. I had to think quick and the solution seemed to be a trusty old potjie pot. I knew a tiny bit about cooking in a potjie pot as my dad, being a hunter (ironic), cooked venison poitjies all the time. I always found it fascinating to watch him cook a poitjie as it took the entire day including preparation. I somehow felt that this commitment to a meal that would be devoured in a matter of 10 minutes is something worthy of figuring out. Cooking for a large group of people, for your family and friends is a loving offering not only of your time, effort and food, but also a personal offering of your love, friendship, and respect. It is an invite to explore ones personal taste, heritage, and culture. After I became vegan, I missed being a part of this meal preparation and offering. Elundini gave it back to me. It took some time to prepare the meal in a kitchen I did not know, with minimal appliances and no oven. It was also somewhat less stressful this way possibly due to the minimalist and eco-conscious approach. After prepping the meal, I layered the lasagna in the poitjie pot and we placed it on top of hot coals. The couple, Elliot (Xhosa) and Lieve (Belgian), who created and run Elundini offered their local cooking skills and taught me their secrets to cooking over fire. Elliot took the drivers seat in the most calming way. I felt at ease handing my meal into the trusting hands of a stranger. I watched him watch the fire like he had control over it but also a lot of respect for it. 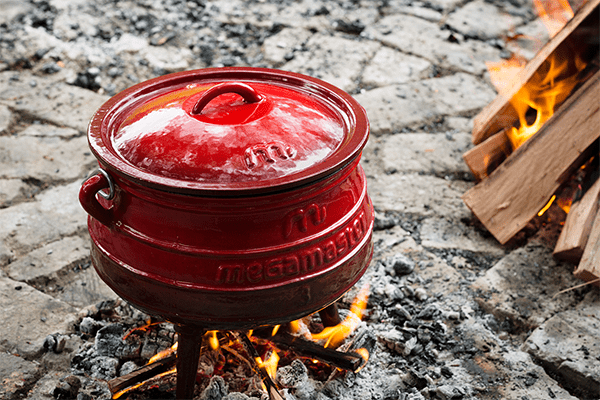 He placed coals on top of the potjie pot lid to make sure the contents would evenly cook. I was nervous as a large group of omnivorous people were relying on my plant-based meal to fulfil them that night and I had NO CLUE how it would turn out. We ate late because of the unexpected preparation and cooking methods, which would usually concern most people but its almost as if all of us disregarded time as an element that night. The meal offered itself when it was ready and we respected that. Elliot just knew when it was ready to be taken off the coals – I don’t know how but I had no doubt in him. Much to my delight, he was right. As the steam evaporated into the cold air, what we saw was the most perfect lasagna . A lasagna that would not have been without myself, my father, Elliot, and Elundini. I offered a serving to each guest that night. It was a meal that not only involved taste but when thought back upon, offers the sound of a crackling fire, a keen respect for the environment, the feeling of cold pollution-free fresh air on ones skin, and the emotion of gratitude. It was a meal I will never forget. I hope that this lasagna recipe will be as delicious and filled with love as mine was that night. Prepare lasagna as per instructions on the box. In a deep oven safe dish layer as follows: Evenly distribute main dish, then butternut, then 1-layer lasagne sheets. Top with nut free cheese sauce and spinach. Repeat. You can also layer inside of a lightly greased potpie pot. Bake in pre-heated oven for 2-30 minutes. OR place potpie pot on hot coals, South African style. Once removed, top with stringy mozzarella cheese and serve. Pre-soak your sunflower seeds for 5 hours in cool water, Or 7-10 minutes in boiling water. Finely chop and Saute the onions and crushed garlic. Once onions are translucent, add couple splashes of water so the onion and garlic does not stick to the pan. Drain and thoroughly rinse the sunflower seeds. Add them to a pan with sesame oil for 1-2 minutes to slightly roast the seeds. Add the mashed potatoes, sunflower seeds, garlic, onion, stock, apple cider vinegar, nutritional yeast, nutmeg, mustard powder, and one cup water to a high-speed blender. Blend for 2-3 minutes until creamy. Sauce will thicken as it sits. You can use the sauce as a dip, on pasta, pizza, potatoes or over vegetables. Drain the cashews and add them to a high-powered blender along with the other ingredients. Blend until smooth. Add watery mixture to a saucepan over a medium heat. Stir with a wooden spoon or metal whisk. Drop dollops immediately over the top of cooked lasagne, or store in a bowl with a lid for later. For pizza, pat some over the crust and let brown in oven.